Manu Joseph is a poster-boy father, if his book is anything to go by. He writes about a family in Madras and their soul searching quest to get to the bottom of their older son’s suicide three years ago. The story thoughtfully plods down memory lane in what is a rich rumination of thoughts, triggers and emotions aroused by a dead boy, who is as much the spine of this story as Ousep Chacko his father, the bare flesh. There is something very contained about Mr. Joseph’s words. “Controlled chaos” is how a friend once described my thoughts, “like a CERN experiment,” he explained. The same expressions return when I read Illicit Happiness. Elements of controlled surprise, steer what could otherwise be a piece of artistic non-fiction. I am not suggesting he is me, or I am this author, for his prose is qualified by years of experience as the editor of a popular alternative mainstream newsweekly that comes out with GOOD quality newswriting way higher than what you see in other mags. (That said, I am also very interested in knowing OPEN’s circulation and sales figures). All I’m saying is that every once in a while or more, it is an honour to spot books of your liking and taste. The day book publishers begin to understand that buyers want to read books that are worthy of them, we (also “publishers”) will be closer to a watershed moment in publishing (and no, digital is hardly that moment, not even the mere excuse for a revolution). Subcontinental literature is the big idea all set to penetrate the middle-class consciousness like never before, offering a new kind of upward mobility. The rise of the mental aesthetes, not unique to their political or geographic communities but to an evolving metamorphosis. And when I spot a contagion of reading habits in traditionally non-reading households or offices, it lights my heart with hope. So, the Chacko family is devastated by the death of their older, cartoonist son. Tales of his gorgeousness, bravado, and goofiness are well afloat the school. Ousep (father) Chacko goes through the excruciating process of tracking down the clue to his son’s death through his final comic strip, as he cross-questions everybody Unni was close to or interacted with during those final days, including the Anglo-Indian teacher who harassed little boys in the lab. Three years later neighbours think Chacko is a lunatic, trapped in an ordinary past unable to overcome an ordinary, even mediocre suicide! If his death was so ordinary, why didn’t Unni leave his mother Mariamma Chacko a note? In normal circumstances, he would have, she insists. And if Mariamma suffers her own demons, their younger son Thoma is not spared either, the litany of ghosts that prey on his waking crush for a beautiful neighbour, a terrible node in a peer triangle. Is Thoma, Unni? Is Thoma good enough for Unni? Or better? Those who haven’t read the book, will also ask, so what is Illicit Happiness? Illicit happiness is the freedom to be what you want to be, act how you want, be how you are, not caring whether you are standing in the male’s queue or female’s for some, or simply breaking home rules by going out to the Marina beach at midnight as a defiant girl, to save the Olive Ridley turtle with other boys or committing your own death as pronouncing a verdict. Illicit happiness is like lying naked with a prostitute without touching her but is also the ability to maneuver others to execute your fantasies to foot your blame. Illicit happiness is like gold. It is the fine line between friendship and enmity; one person’s joy is another’s misery and thus happiness dictates a certain discretion which also sometimes leads to injustice and death. Unni’s death was well-mourned but forgotten, until we find out otherwise. Neighbours remember him, even miss him. So do his friends, but retention is short, and people have themselves and their futures to worry about than recall the passing. Which is what this book is about: an absurd trenchant journey of a parent (or two parents and a son) down memory lane, which is the only desperate scene of crime as they hunt for a turning point in Unni’s life. It is the misanthrope alone who has clarity. By standing outside the huddles of man, he sees a lot, and what he often sees is the evidence that people are not as smart as dogs think they are. And he wants to see it time and again. In the fog of ambiguities and mysteries, he desperately searches for truths because truth usually shows humanity in a poor light. Balki and Unni are similar in that way. Unni, too, was exceptional, he was strong, so he did not need to belong. Unni, too, stood beyond the bonds of people because that was a good place to stand and watch. And Balki does not want to concede that such an endearing foe of the ordinary was ultimately defeated by the world. For that is what Unni’s death is until proven otherwise — a defeat. Balki will do all he can to take Ousep closer to the truth (182-3). Was he depressed or in a hieghtened state of happiness all the time? (Was he a “corpse”, or an “anti-corpse”?) Was he schizophrenic, or just an ordinary gifted child with heightened powers of observation? Did he die over unrequited love like so many folks in Madras who fall in love and fall into “four types of suicide”? Unni’s narrative directs his father’s own, as the emotional superreporter tracks down his son’s wanderings. Unni spoke to and observed his mother as often as his mother kept silent with her husband. Son would tell mother, “Truth is not consistent. It changes from brain to brain. The truth of every neurological system is unique and it cannot be transmitted. It cannot be told, it cannot be conveyed, it cannot be searched for and found. Delusion, on the other hand, is contagious and transmits from one brain to another in order to survive.” His mother his confidante, would have to digest his implication that two people were deluded together, but only one person knew the “unique, inconsistent truth.” Hectic conversations power this story in between plot points, as we are led to wonder at the philosophical genius that undercuts Unni’s err… folly of one. Was he at the helm of under-appreciated leadership? We are what we once were. Childhood influences us in ways we may never fully realise. Thoma his brother, trudges along, just about in step with his time, free of the burden of genius, or expectation. This story sits deeply in the recesses of the mind. Why do men who molest women get away? What is the best form of revenge? What is the fine bond between human beings that snaps free in times of desperation? This tale is as much about a boy getting to grips with the menace of manhood as his urgency to master the truths of mankind. As one of Unni’s surviving friends who is a scared simpleton and now recluse since Unni’s death, ends up confessing to Unni’s father, “I don’t want to know the truth. I don’t want to see beauty. I am just another boy in Madras who wants to escape to America.” You think the story stops here, but it has only just upped the mystery of Unni’s death, one notch higher. 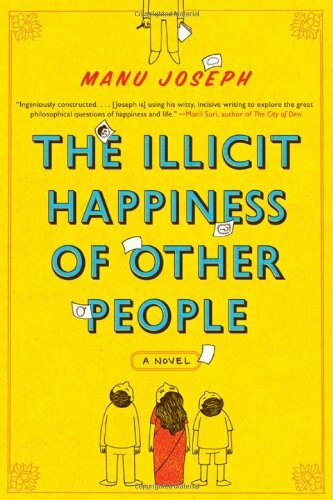 The Illicit Happiness of Other People is a deeply resonant, muscular satire that will be lifted off the shelf several times by men and women alike.